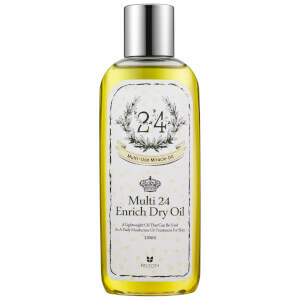 Pamper yourself with the Mizon Multi 24 Enrich Dry Oil; a versatile formula that can be used on the face, body and hair, and is also suitable for sensitive skin types. Fast absorbing, the silky oil glides onto skin and offers superior moisturising properties. Enriched with Olive and Argan Oil extracts, the formula delivers an effective veil of hydration that helps to reveal a radiant complexion. Complete with a skin-loving blend of Rosemary and Ylang-Ylang, the Multi 24 Enrich Dry Oil leaves skin feeling soothed and protected. Apply a small amount onto cleansed skin, dabbing and wrapping with palms for absorption. Can be mixed with essence. Olea Europaea (The Olive) Fruit Oil, Neopentyl Glycol Is Diheptanoate, Caprylyl Glycol Is, Dimethicone, Ethylhexylglycerin, Tropolone, Argania Spinosa The Kernel Oil, Limnanthes Alba Is (Meadowfoam) The Seed Oil, Helianthus Annuus (The Sunflower) The Seed Oil, Tocopheryl Acetate, Macadamia Ternifolia The Seed Oil, Enothera Biennis (Evening Primrose) Oil, Tocopherol, Ascorbyl Palmitate, Rosmarinus Officinalis Leaf Oil, Abies Sibirica Oil, Cananga Odorata Flower Oil, Citrus Limon (Lemon) Peel Oil, Lavandula Angustifolia (Lavender) Oil.